before that date some sort of hostelry existed on the site. In those days the sea came up to where the village school now stands. The Ship Inn was situated very close to the shoreline- an ideal spot for smuggling! It is rumoured that at least one secret tunnel exists, linking the Inn to a nearby cottage: useful for getting rid of contraband when the excise men came knocking! In 1682 The Ship was a venue for a clandestine meeting between smugglers and a corrupt revenue officer. The story leaked out and the revenue offi cer stood trial. Throughout its long history the Inn has been at the forefront of village life. Sometimes the close links with the community were not always very happy. In 1754 shooting at the Inn’s sign seems to have been a local sport. The then owner was given 10/6d in compensation. Usually however, the Inn and the village lived in harmony. Over the years, until fairly recently, many customers rode to the Inn on their ponies and tethered them outside for the evening while they enjoyed a few (or more than a few!) drinks. At the end of the evening the Inn staff would help the riders back on to their ponies who fortunately knew the way home. Occasionally the staff would make a mistake and put the wrong rider on a pony. In those cases the pony arrived home safely but the rider would get a surprise in the morning. The Ship Inn was well known as an alehouse and had its own malt house in the grounds. This must have been useful when “Club Days” were held here. In the late eighteenth century and early nineteenth century, workers formed self -help organisations. Members would meet regularly and, from time to time, organised social events, outings and meals. The Ship Inn hosted many of these. Close links with hunting were always a feature of life at the Inn. Around the time of the 1800’s “Venison Feasts” were held at the Inn to celebrate the end of each stag-hunting season. In more recent times competitors in the Holnicote horse races used to meet at The Ship before taking part and return later to either celebrate or drown their sorrows. Inn has welcomed many travellers. Until 1843 they would have arrived mainly on foot or on horseback. In that year, however, the fi rst stagecoach came to Porlock. This had been especially hired for an excursion to Lynton. Its appearance outside The Ship led to “scores of the inhabitants” surrounding it. new road designed to bypass the infamously steep Porlock Hill. Since it was a toll road many chose not to use it. The road was dug out manually to provide work for local people following the Napoleonic Wars. Tolls were taken at the bottom of the hill by staff at The Ship Inn. There used to be a tollgate opposite what is now the village hall. At busy times of the day staff would run out from the bar to deal with travellers; at less busy times one of the boys would sit by the gate. Stagecoach descending Porlock HillWith the coming of the stage coach the Inn entered a new phase of its existence. The steepness of Porlock Hill meant that two horses had to be stabled at the Inn. These would help the already exhausted stagecoach horses to climb to the top. 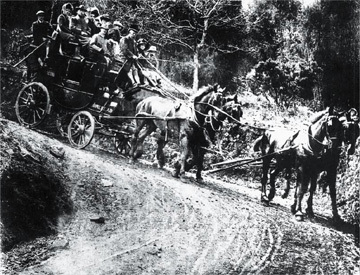 Lots of evidence of the importance of horses and stagecoaches to the Inn still exist. There are mounting blocks just outside, designed to help riders climb onto their horses or passengers to get into the stagecoach. The old skittle alley was part of the stable block. It is rumoured that the horses used to look over their stalls as the skittler’s played their hands. The stables themselves remain intact and it is easy to imagine the coach horses resting there before the long journey up the infamous Porlock Hill. Over the centuries there have been many adaptations to the buildings. It is suspected that part of a building, which predates the Inn, is still incorporated into the building. A tiny gothic style window in the outer wall may be proof of this. Considerable amounts of rebuilding took place in the eighteenth century. Within the last fifty years there have been many changes which several of the locals still remember. The grounds of the Inn, for instance, used to extend much further back. Much of the extra land was used to grow vegetables that were served up in the Inn’s dining room. The pub area of the Inn used to be smaller, with the pool room being used as a dining room. The current restaurant area was split into small rooms off a long corridor. These were used as residents’ TV lounges and a housekeeper’s room. The “Upper Deck” did not then exist. Changes continue at the Inn with the remodelling of the bungalow in the grounds and the refurbishment of one of the old outbuildings to make a new skittle alley and function room. Records of licensees and managers can only be traced back, so far, to the mid – 18th century. In 1744 Catherine Powell, believed to be the widow of Thomas Powell who had previously run The Ship, was named as the alehouse licensee. The Ship remained with the Powell family for some time. In 1746 John Powell took on the licence. His widow, Joan, took over in 1756. 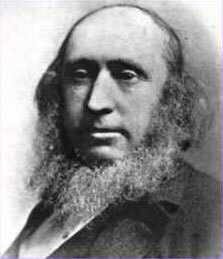 From 1794 until the early years of the 19th century George Ford was licensee. In 1822 Nicholas Smith took over to be succeeded by Elizabeth Smith in 1840. In 1872 Mrs Pulford was named as licensee. From 1894 William Rook was named. Ownership of The Ship remained with the Rook family for many years, although for some time they employed a manager, Mrs Board, who was well known for her high standards of hospitality. Mrs Robinson owned The Ship for a number of years followed by Alan and Jacqueline Cottrell. The present owners are Royston and Caroline Connor who bought The Ship in 2006 and live here with their young family. As you might expect there have been many notable visitors over the years some more welcome than others. During Lord Nelson’s time pressgangs are believed to have come to The Ship to listen to the locals gossip in the bar. They would have encouraged young men to drink themselves senseless and then carried them off to serve on the royal navy’s ships for the next few years. Conditions on these ships were so appalling that few would volunteer for service. A ghostly visitor occasionally makes an appearance. She is, however, a very benign old lady so she is probably more welcome than unwelcome. There are also stories about a door, which was locked, that should not have been and a bed that was slept in when the room was unoccupied. In his honour there is now a special “Southey’s Corner”. Coleridge, while writing “Kubla Khan”, complained that his poetic inspiration was interrupted by a visit from “a person from Porlock”. We think that it was someone from The Ship Inn asking him to settle his drinks bill! 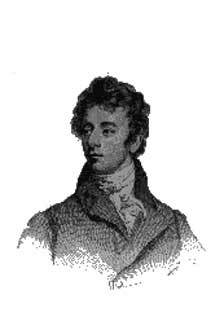 Both Southey and Coleridge developed a taste for potted laver, one of Porlock’s traditional dishes. 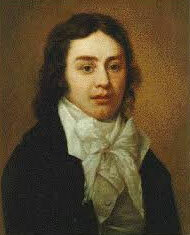 In fact, when he left the area, Coleridge asked a friend of his to send him supplies. In 1869 RD Blackmore published his famous novel “Lorna Doone”. Although a work of fiction, it was partly based in fact. The Doones had been a band of local robbers who had terrorised the neighbourhood. Scenes in the book were set in The Ship Inn, as they must have been in real life. HG Wells and his partner Rebecca West are believed to have stayed here. More recently our most noticeable guest has been a teletubby – Lala! Many stories are recounted about local characters who have visited the bar over the years. One man was so insistent on his particular spot at the bar that even at the height of the busy season when the bar was packed, he would insist on pushing his way gently (or not so gently) to that particular spot. If anyone were occupying it, he or she would be nudged away. Once in position he would stay there for the rest of the evening, ignoring any attempts to move him. Another resident described an incident from his youth. The local policeman used to hide under the arch and stop anyone who looked rather young from entering the pub. He would insist that the youngster needed a chaperone and would accompany him into the bar. Once inside the policeman would note that a youngster should not drink on his own and that he must drink with him, at the youngster’s expense of course! Folksingers are regular visitors to the bar. This continues a tradition begun many years ago of having regular musical entertainment. The present owners organise regular folk events and encourage local musicians. The life of the Inn continues and history is being made and lost all the time. One of the staff recently told us that one of the rooms contained old glass upon which visitors over the last two centuries had scratched their initials and the dates of their visits. Sadly that had disappeared before the present owners had moved in. Interesting new facts are being discovered all the time, however. A letter arrived from New Zealand a short while ago. The husband of the writer was the great grandson of the man who had installed the small window in Southey’s Corner in the early 1800s. This was put in so that patrons had a view up Porlock Hill. It seems so strange that news of an event from two hundred years ago, long since forgotten here, should reach us, unexpectedly, from the other side of the world. It just goes to show – The Ship Inn is certainly world famous!